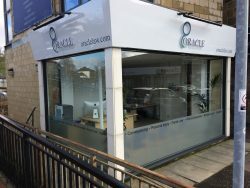 Oracle Law has opened a new Clarkston office at 1A Helena Place, Clarkston Toll. The company has contemplated opening an office in Clarkston for many years but have been unable to secure suitable premises until now. Our new office location at Clarkston Toll is now open and will be run by Colette Kerr. As we can call on the expertise of our colleagues in Glasgow City Centre we can provide a large range of services to individuals and businesses which are often not available from the typical High Street Solicitor. We have available the expertise of John Carruthers who is a solicitor advocate and deals with litigation and business law. Chris Pollock is a STEPS qualified solicitor who specialises in wills, estates, the law relating to the elderly and property. Colette Kerr has for many years specialised in Family law and is also available to advise on other disputes. Finally, Paul Fairbridge has significant expertise and success in claims against the banks, mis-selling and commercial disputes. We can be contacted at cmk@oraclelaw.com and by telephone at 0141 404 1092.